PRIDE is the FNR’s main programme for funding doctoral research in Luxembourg. It aims to support the development of critical mass in key research areas, by attracting excellent PhD candidates to Luxembourg and offering them high quality research training. Under this programme, a block of PhD grants is awarded to a consortium of excellent researchers united around a coherent research and training programme. PRIDE is open to all domains of research and technological development. 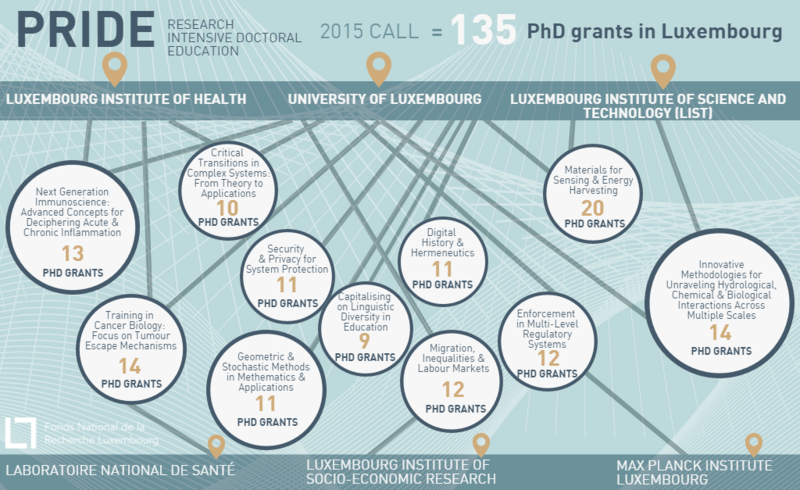 In the 2015 PRIDE call, 135 PhD positions were awarded in blocks to 11 successful Doctoral Training Units (DTUs). These 135 PhD positions were complemented by 20 PhD and 2 institutionally funded Postdoc positions. 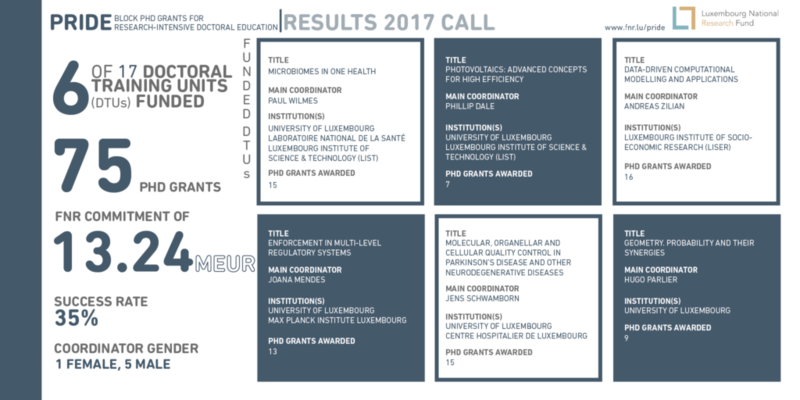 In 2017 PRIDE call, 75 PhD positions were awarded in blocks to 6 successful DTUs. These 75 PhD positions are complemented by 15 PhD and 3 institutionally funded Postdoc positions. Compared to the AFR individual grant scheme for PhDs, PRIDE provides greater advantage to institutions and PhD candidates, as institutions are able to immediately offer a full PhD grant to promising candidates, without having to undergo a separate application and selection procedure at the FNR. The duration of a PRIDE project is up to 6.5 years. A specified number of PhD grants (each grant comprising the equivalent of a 4-year PhD employment contract + a training & mobility allowance of 6.500 EUR). A lump sum of 10.000 EUR per PhD grant paid to the DTU in order to pay for training and other DTU direct costs. Prospective PhD candidates apply directly to the successful DTUs for a PhD position. Both the “Commitment of participation” and the “PRIDE Full proposal” must be submitted by the DTU coordinator through the FNR Online Grant Management System.